Code Is Free Speech, a coalition of five U.S. groups, said the ban on publishing blueprints for 3D guns violates the First Amendment. A coalition of gun rights advocates challenged a federal judge's order temporarily barring a Texas company from publishing blueprints on the web to make untraceable 3D-printed guns by publishing similar blueprints itself on Tuesday, saying such publications were protected by the First Amendment. After years of litigation, U.S. District Judge Robert Lasnik issued a temporary restraining order earlier in the day blocking Defense Distributed of Austin, Texas, from relaunching on Wednesday with blueprints for plastic firearms that can be "printed" by machines using computer-assisted design, or CAD. During the Obama administration, publication of plans for 3D guns was barred under an interpretation of federal export laws that ban the foreign distribution of firearms. Defense Distributed challenged the interpretation, and in June the State Department reversed course. It issued a letter last week agreeing that making such blueprints public didn't violate the export law. In a seven-page ruling issued Tuesday in Seattle, Lasnik acknowledged that the First, Second and Fifth Amendments to the Constitution raised legitimate questions about banning publication. But Lasnik wrote that it was up to the courts to rule on those issues and that in the meantime, the eight state attorneys general who have sued to make the ban permanent "are likely to suffer irreparable harm in the absence of preliminary relief." He scheduled another hearing for Aug. 10. In response, five gun-rights activist groups based in California and Washington state posted a website called Code Is Free Speech, along with what it advertised were CAD blueprints for several high-powered firearms, including the AR-15 semiautomatic rifle, the AR-10 battle rifle and the Beretta 92FS semiautomatic pistol. The site could be in violation of Lasnik's order, which barred the federal government from enforcing the settlement with Defense Distributed "as if the modification had not occurred and the letter had not been issued." A spokesman for the coalition didn't immediately respond to a request for comment. By publishing the plans, the coalition said in a statement, "we intend to encourage people to consider new and different aspects of our nation's marketplace of ideas — even if some government officials disagree with our views or dislike our content — because information is code, code is free speech, and free speech is freedom." It said it hopes to "promote the collection and dissemination of truthful, non-misleading speech, new and evolving ideas, and the advancement of the Second Amendment right to keep and bear arms." It specifically thanked Defense Distributed for its "courage, passion, innovation, and inspiration." Defense Distributed had already agreed to stop uploading new files pending court rulings in New Jersey and Pennsylvania. #BREAKING: Cody Wilson backs down. 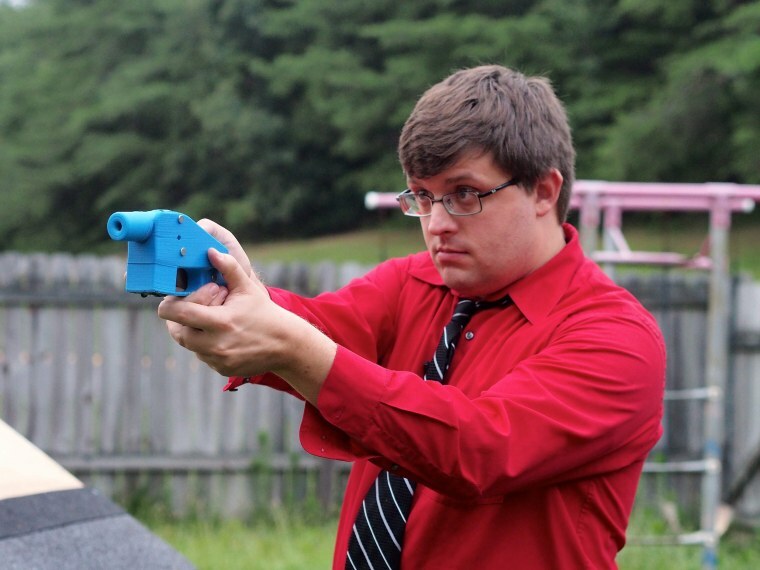 After NJ takes him to court, Wilson agrees not to post any new dangerous 3D printable guns until our September hearing. Court orders him to keep his word. The fight for public safety continues. The 3D plastic guns, which fire conventional bullets, would be untraceable if they were used in a crime, because there's no serial number. And plastic guns could more easily slip through metal detectors. But some gun rights supporters told NBC News that it's unlikely that criminals would bother trying to make their own guns. "I think it makes little practical difference in the Unites States, because with a black market, people who shouldn't have guns are still able to buy them anyway," said David Kopel, professor at the University of Denver law school. President Donald Trump indicated Tuesday that the controversy had taken him by surprise, saying on Twitter that allowing publication of blueprints "doesn't seem to make much sense!" After the president's tweet early Tuesday, State Department spokeswoman Heather Nauert said there had been "a lot of misinformation and a lot of misunderstanding about this issue." "The reason that the State Department got involved, our only equity in this, is because of our role in controlling foreign access to U.S. defense technology," Nauert said. Nauert said the State Department agreed to change the rules on publication of 3D weapons blueprints on the advice of the Justice Department. "This has obviously gone through a legal process," she said. "We were informed that we would have lost this case in court or would have likely lost this case in court based on First Amendment grounds. We took the advice of the Department of Justice, and here we are right now."